Find a wonderful selection of unique Valentine’s Day Gifts! We have a wonderful collection of heartfelt and unique valentine’s day gifts. Find perfect gift for your loved one! Why not change up the chocolates or flowers for something different? Make sure you order your gift in time. See our delivery dates below for our UK delivery. This romantic gift is a great way to celebrate your relationship. 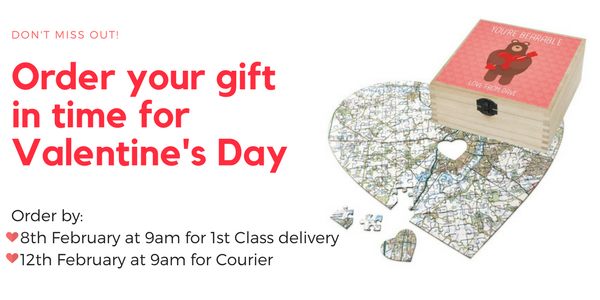 Enter a location special to you and your partner for your personalised heart shaped jigsaw. Add both your initials to the ‘Together Forever’ box top design. A very thoughtful and unique gift that can be treasured forever. In the gift set is a personalised heart shaped Jigsaw puzzle with a heart shaped piece in the centre, located on a place special to both of you. Arrives inside a luxury personalised wooden box. Add your name to the design, to make your gift personal and even more of a romantic gesture. Central to this sentimental gift are jigsaw pieces that spell out ‘I love you’ over the location where you first met your loved one. This could be a bar, club, restaurant, office, shop or anywhere else! It will show just how much that single moment meant to you. It is the ideal gift for Valentine’s Day or wedding anniversary. How can you really define Love? The dictionary says ‘A profound, passionate affection for another.’ We think that a dictionary definition simply isn’t enough – it needs a personal example. So we have created a beautifully designed framed print, which not only features a basic dictionary definition of Love, it features two names and places of people who are shining examples of what love means. Find even more amazing Valentines Gifts on our website. Your loved one will love their unique and personalised gift. All of our gifts are handmade in our warehouse in Devon.